Argan oil is derived from the seed of the fruit growing on the Argan tree, which only grows in Morocco. This limited growing location makes argan oil one of the rarest oils on earth and we also think it is one of the best. 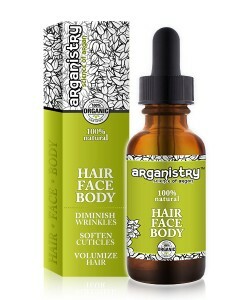 Used from scalp to toes, argan oil benefits the entire body, hair, skin, and nails, and it can now be found at Naturalskinshop.com in their newest formula, Arganistry Organic Hair, Face, and Body Oil. This new formula combines organic argan oil, as well as other organic natural oils that are packed with essential nutrients for the hair, skin, and nails. When applied to the scalp, you get the amazing benefits of treating both the skin and hair at the same time. A few drops can be massaged into the scalp to treat inflammation, irritation, and dryness. The high content of Omega Fatty Acids and vitamin E provide healing, moisturizing, and antioxidant benefits to the skin. The natural oils mimic the natural oils produced by the skin for an ultimate hydrating effect. A healthy scalp then naturally leads to healthy hair growth. Some studies also suggest that frequent scalp massage with argan oil can prevent hair loss. 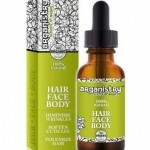 As you can see, Arganistry Organic Hair, Face, and Body Oil by Naturalskinshop.com will provide you with the promise of endless good hair days and healthy skin. The uses for this miraculous treatment are endless and you’ll love finding new uses and new ways to apply it. Perfect for basically all skin types, skin tones, hair types, and age groups, this is the next big thing in organic body care. Shop all argan hair, face and body product here. « Anti-Aging and Exfoliation: Two must-have’s for your skin!